What surprised me most was that this psychological thriller is actually B.A. Paris' debut novel. It's a very promising one as the narrative is really well developed and she successfully maintains suffocating atmosphere as new facts about the antagonist are revealed. Switching from present to past helps in achieving that effect and stirs up curiosity. While reading I constantly wanted to go through just one more chapter to find out more about current events and actions from the past that preceded them. At first Jack and Grace seem to be a perfect couple. They're young, beautiful, live in a splendind house. Jack is a successful lawyer and has never lost a case in court where he always defends women who are victims of domestic violence. He may seem a bit overprotective though, as he never leaves Grace's side. The appearances are of course deceptive and as we gradually learn new facts about the present situation and past events that have led to it, the novel becomes even more suffocating. 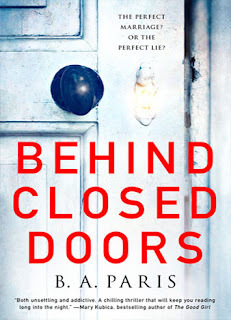 Behiond Closed Doors is a very promising debut and I hope to read more from the author in the future.